Data scientists have a tough job — no matter how bad or dirty data is, we need to come up with ways to make the data consumable. At SocialCops, we’ve been building tools that allow the most complicated data sets to be visualized in the most simple ways. In the search to make data digestible, we discussed and debated which is the best tool for presenting our insights. I spent some time dabbling with two tools in the market — Google Charts and D3.js — and hope to review both tools objectively through this blog post. This review is just a view of my own google searches, opinions, and experiences, so please feel free to give suggestions, advice, or opinions in the comments section below. Google Charts is a Google product that contains various charts ranging from the simplest line graph to a complex hierarchical tree map. With ready-to-use examples for all the charts and easy-to-implement features like embedding and exporting charts as pngs, Google Charts have come a long way since it was introduced in 2007. D3.js is a different kind of tool altogether. It is not a core charting tool, actually. As the name suggests (Data Driven Documents), it’s a library used to manipulate DOM objects using data. D3.js offers extraordinary flexibility and doesn’t tie you to a strict framework, letting you implement creative, complex thoughts on data visualization. Google Charts can’t create many variety of graphs when compared to D3.js; but what it can complete, it does it perfectly. It has a very easy-to-use API, compared to D3.js where you have to build every axis, line, and bar from scratch. In Google Charts, just call the graph, enter the data correctly, customize the style and bingo, you are done. Google Charts has a big plus point as you can easily export charts to pngs. We can achieve the same effect in D3.js with some tweaks, but there is no direct and easy support from D3.js. One of the major points in favor of D3.js is that you can make your visualizations the way you want. This is not possible in Google Charts, where you can only create frequently used charts like bar, line, column, etc. While some of the Google Charts do not support a large amount of data and have some limit, D3.js can be used for data ranging from bits to gigabits and it will still go strong. Even with the general graphs, you can add many other DOM functions in D3.js like zoom or click functions for any graph you want, which is not quite possible for all the Google Charts. We’re always looking for new team members. Think you’d be a good fit? 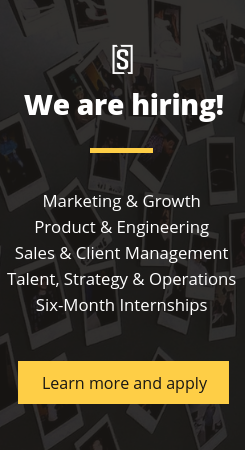 Check out our open positions here! There’s no correlation between Linux and D3.js, or Windows and Google Charts. I think you’re trying to liken the greater complexity, flexibility and control offered by D3.js to similar benefits of Linux over Windows which would be a fair comparison but only as an analogy. If that’s the intention it needs some rewording – the way it is you’re either saying if you like complexity for the sake of it choose Linux and D3.js, or worse, you’re saying if you use Windows then the simplicity of Google Charts is suitable which is really presumptuous. Nowadays a better comparison might be to C3.js, which provides charts built on top of D3.js . Could you please add that comparison? As someone who’s just started getting his hands wet with d3, it looks pretty daunting. I guess once I get ahead of that learning curve, it should become more and more obvious that It’s not just a charting library. Thanks for posting this article. It is very useful. Even though you prefaced this with “on a lighter note”, I don’t think Mac OS users are smarter than Windows users necessarily. The prevalent opinion that Windows users are dumb is simply not accurate.